This is what I came up with to use as a livewell on my 15' Boston Whaler. I bought a round drink cooler at Wal Mart, and removed the handle on one side. 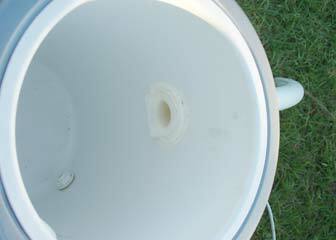 In its place, I drilled a hole with a hole saw and installed an ordinary plastic bulkhead fitting. On the other side and somewhat lower, I drilled a much larger hole and put a plastic bulkhead fitting which has a flat flange, designed to sit low to the deck in the transom on boats with self-bailing cockpits. I will mount a small plastic coarse screen on that flange, to prevent smaller baitfish and shrimp from escaping overboard. 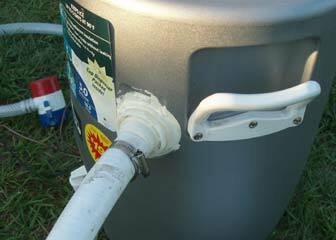 On the outside, I put a short length of hose for the overboard drain. Here's an overhead view of the whole assembly. And here is my custom-built livewell tucked into a tiny space in the stern of my boat. A live bait well on a small boat is never easy, especially if the boat can't be outfitted with a built-in livewell of any size. I used to use a 5 gallon bucket with a perforated plastic bait lid, but it had to be lifted in and out of the water at each fishing stop, and recirculation was not good with holes only in the lid. I had to drain about half the water out before running at speed in any waves, or water sloshed out into the boat. I decided I needed a removable livewell that could either intake water from over the side or recirculate its own water with a small bilge pump. Here is what I came up with. 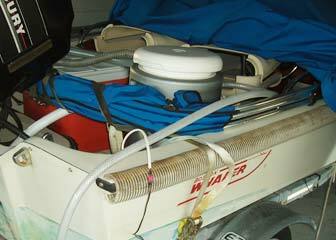 When it is sitting in the back of my 15 Whaler, I can hang the hose with the bilge pump overboard and plug it in to a switched cigarette lighter type 12 volt outlet on the console of the boat. The hose is long enough to hang down a couple of feet, where water is cooler and more oxygen-rich, which will mean lively bait on a hot day. 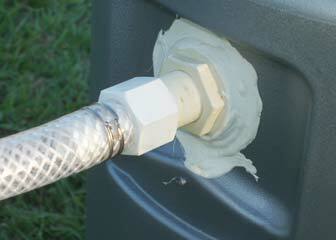 I run the drain hose into the self-bailing motor well. When running between fishing spots, the lid prevents any water from splashing into the boat, and I just put the hose and bilge pump on deck. 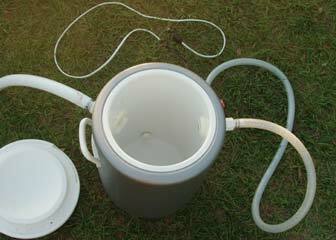 I can also put the pump inside the cooler livewell and make it recirculate as a livewell aerator pump. I also have a 12 volt outlet connected to a couple of alligator clips, so I can clip on to any 12 volt battery and plug in the live bait well pump. I can bring it along on other boats that don't have a live well, as long as there is a battery, or I can bring a battery, too. This livewell works great, and was cheap and easy to build. My expenditures included some through hull marine bulkhead fittings meant for above waterline use, some hoses, a small bilge pump, and a cooler. I already had some wire and I bought a 12 volt cigarette lighter type plug fitting to put on the end. I used crimp connectors sealed with plastic liquid electrical tape to connect the bilge pump wires. Instead of stainless steel hose clamps, I used my new ClampTite clampmaking tool to make my own stainless steel wire clamps on the hoses. The whole thing cost about $60-70 in parts. thats so cool i bought a live well pump for my boat to make a 25 gall bait tank but when all hooked up i had to keep priming it. so i guess i should of got a beilge pump instead. do you think my pump is not strong enough it pumps 800 gall in an hour ? The city that I live in is selling an old 500,000 gallon elevated storage tank. I’m gonna cut the legs off that sucker and cut a big door in the top and pull it behind my boat with a chain. I’ll use the fartmaster 5000 for aeration (solar powered of course to be green). I need this setup for whale fishing. Great idea. Everything is quite clear about building this livewell except how to get 12v to the bilge pump. I don’t see from the photos how this is done. I just run the 12 volt wires to a jump battery carried for the purpose, so I don’t drain the boat’s single starting battery. I like the concept – round wells are better for baits than square ones. It appears from the photos you did it backwards though. The pump inlet should be low near the base of the well. The outlet should be near the top. Clean water flows in from the bottom and overflows out the top, allowing more clean water to stay in the well. Your set-up pumps water in from the top, creating a of splash and turmoil, then drains out from the lower drain. 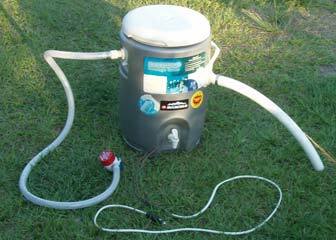 Reverse your setup and you get more clean water in the well for your baits. ddakota, I appreciate your suggestion, but put the hoses that way to provide better aeration than a bottom load would. In very warm water, some splashing can keep the bait alive and kicking. you did great job it nice for people like me that dont know how to do it. thank you . Nice idea. I’ve been looking for some ideas that are less costly than the “manufactured” rigs on the market. There are some 12-18 gallon (I haven’t checked the exact size, as yet) plastic drums here, complete with screw-0n lids, for ten bucks. I will be trying out one soon. Perfect for the “occasional” live bait angler (I normally use artificials of one kind or another). DDakota is right, I think…inlet at the bottom (or close to it), and overflow pipe a few inches below the top. Great idea. And, thanks. Awesome! Thanks for this info with photos. I own a 17 ft. Montaulk. 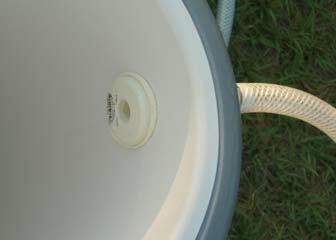 I will place the supply up at the top so it is easier to hang the pump overboard, but I will install clear flexible hose to the bottom of the cooler so that it will cause a circular flow from the bottom to the top where the spillway will be. the man is right about the inlet should be at the bottom of the tank, my husband built ours and we put shag in it for stripe fishing, the shag keeps longer…the round well are better, they dont live long in a square cooler. Enjoying the bait tank you made. Well I am in progress of making my own from a 20 gallon Igloo ice chest. I drilled two holes one for a inlet at the bottom of the cooler and one for a outlet near the top. I placed a pump that pushes 2.8 GPM. to a hanger I atached to the hull. Then dirrect wird it to a on of tago swich.. All is in shrink wrap as to the connections. Providing both a dirrect connection with a manual shut of switch then a set of jumpers that can be connected to the battery. It should work well we will see in a mounth when I go out to the lady the sea agian. Thanks as alwayes this place has given me knowladge that was helpfull. Your friend Steve. Thanks so much. This is the better of the bunch DIY baitwell instructions. Ive made 2 already. Thanks again for the info!